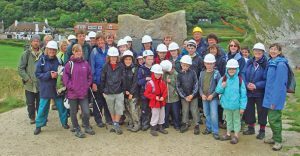 Rockwatch is having its 15th Residential Fieldtrip to the Jurassic World Heritage Coast of Dorset and East Devon. This year there is a slight change in the timings and the trip now runs from Sunday to Thursday. You will be staying at Leeson House Field Studies Centre with it’s excellent facilities and the cost of the trip is: Adults (from age 18 years) £315, first child £220, subsequent children £140. This covers all costs during the stay including local transport. Numbers limited and over 7s only. Just email hello@rockwatch.org.uk to make sure you get on the trip!